Valentine’s Day doesn’t have to be about romantic love. 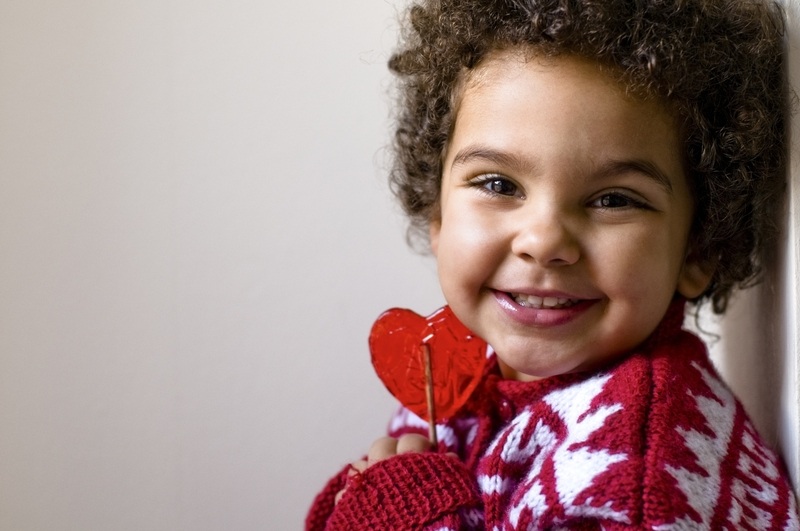 Show your kids how much you love them by doing some of these fun V-Day activities! 1. Slip a Valentine card under each kid’s pillow and tell them to check underneath for a fun surprise when they wake up. 2. For breakfast, cut out toast with a heart-shaped cookie cutter. Spread the heart shape with cream cheese and top with strawberry or raspberry jam. Then, use the rest of the bread by placing the piece of toast with the heart cut out on a plate and filling the center with red berries. Wet the rims of wine glasses or plastic cups then dip into pink or red sugar. Fill the cups with sparkling apple juice. 3. Draw a large, open heart on the bathroom mirror at kid-height with a dry erase marker. Write “I love” with an arrow pointing to the heart. When your child looks in the mirror to brush their teeth, his or her face will be in the heart! 4. Glam up lunchboxes by using your heart cookie cutter to shape sandwiches. Include a treat of Valentine candy and — of course — a love note. 7. Cook up a Valentine-themed dinner. Serve heart-shaped individual pizzas or top pizza with heart-shaped pepperoni. (You get those by cutting pepperoni pieces into hearts with a mini-cookie cutter.) Many pizza companies offer heart-shaped pizza for takeout or delivery on V-Day as well. Serve with pink milk or sparkling juice. 8. During dinner, have each family member say why he or she loves the person sitting next to him or her. Go around the table one way, and then do it again in the opposite direction. 9. After dinner, cuddle up in PJs and watch a Valentine’s Day show. A few suggestions: "Cat in the Hat Knows a Lot About That: Hurray! It’s Valentine’s Day," "WordWorld: My Fuzzy Valentine" or "Madly Madagascar." 10. Don’t forget story time! Try one of these love-themed books: Queen of Hearts by Mary Englebreit; Love, Splat by Rob Scotten; Snowy Valentine by David Peterson; I Love You, Stinky Face by Lisa McCourt; or Pete the Cat: Valentine’s Day Is Cool by James and Kimberly Dean. Spread the love by trying one or more of these ideas this Feb. 14. By replacing candy and gifts with time spent together, you will surely brighten your kids’ days and make fun family memories. This story was originally published on Jan. 23, 2017, and updated on Feb. 7, 2017.